Who needs the rules of the 1900s to explain proper wedding shower etiquette to us today? In part one of this series, we discussed modern-day etiquette pertaining to invitations and guestlist. In this article, we are talking about planning and preparation! As the host of the event, you will need to decide on the date, the location, the menu, the theme, the games or activities, and the “flow” of the party. 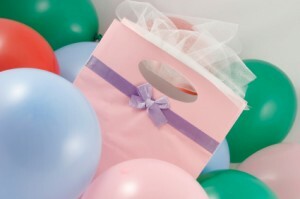 Date: Wedding showers should be at least a month before the wedding. Most are between one and two months before. Location: You can have the party at someone’s house, a restaurant, or another location such as a spa or bed and breakfast. If you are going to have it in a location other than someone’s home, make sure you reserve it well ahead of time. The location can match the theme of the party if you have a theme. For example, a Bridal SPArty would be held at a spa. Menu: Most of the time, finger foods are served at wedding showers. The menu can go along with the theme but here are some ideas: tea sandwiches, vegetable tray, fruit tray, assorted cheeses, or cold salads. Depending on the time of day, you may also want to serve dessert too. Cake is served at most bridal showers. If you are planning on serving a meal, here are some ideas: baked ziti, stuffed chicken breast, four cheese ravioli, or quesadillas. Another idea is to do a pot luck shower where everyone brings something different. Wine or champagne can be served if there are no religious objections. You definitely want to check with the bride first. Theme: You can choose to have a theme or not. Here are some fun theme ideas: A Day at the Spa, Lingerie Shower, Summer Luau, Pajama Party, or Afternoon Tea. The theme can also go along with the menu: Dessert Shower, Sunday Brunch, Cocktail Party, or Country BBQ. You can also try to match the theme of the wedding. Who knows the bride best? The hostess of the party should come up with a list of questions that the bride answers before the shower. Everyone gets a sheet of paper to write down their answers, and the hostess asks the questions. After all the questions are asked, the guests switch their papers and grade one another’s. Bridal Pictionary: The hostess(es) of the party write down wedding-related words on strips of paper (examples: veil, bouquet, cake). Divide the room into 2 teams. Each team takes turns having a player go and try to draw the item in 30 seconds. Advice for the Bride: Everyone writes down their best advice for the bride. Some will be serious and some will be funny. Then, the bride has to guess who gave her the advice. TP Wedding Dress: This is actually a pretty popular bridal shower game. The guests are divided into teams and each given a roll of toilet paper. They choose one person on their team to model. Then they design a wedding dress using the toilet paper (and if you choose, some other items such as ribbon, rhinestones, etc.). The bride chooses the best dress. How well do the bride and groom know one another? The bride and groom sit facing one another, each with a small dry erase board. The host(s) prepare questions to ask the couple about each other. (Examples: What is your fiance’s favorite TV show? What did he/she want to be when he/she was a kid?) They try to guess each others’ answers then see if they are right or wrong. Advice for the bride and groom: Everyone writes down their best advice for the bride and groom. Some will be serious and some will be funny. Then, the bride and groom have to guess who gave them the advice. Famous Couples: If you are throwing a couples shower where only couples are invited, you can try this game. Otherwise, it might make the singles feel bad. As each couple walks in, they have to pick a famous couple from movies, TV, or cartoons (ex: Scarlett O’Hara & Rhett Butler, Lucy & Desi, Fred & Wilma Flintstone). Then, they have to try and get the others to guess who they are. 2 Truths & a lie: Each person describes him/herself with 2 truths and 1 lie. The other have to figure out which is the lie. The Clothes Pin Game: As the guests come in, they get one to three clothes pins to put on their shirts. They are not allowed to say “wedding,” “bride,” or “groom.” If a guest hears another guest say one of the words, he/she can take a clothes pin from the person who said the forbidden word. The one with the most pins at the end of the game wins. If you are close to the bride or groom and/or a member of the wedding party, you can definitely offer to help with the shower. However, this is definitely not mandatory. For the most part, the bride and groom should be free of any responsibilities. However, the hostess should definitely get their input on the theme and location of the shower.